Hold onto your seats – this show will be a high-octane ride which will blow you away!!! The new generation of choreographers ! Tannos+Choice are Stephen Tannos and Morgan Choice– young, vibrant, exciting and pushing the boundaries of choreography and dance in Australia. 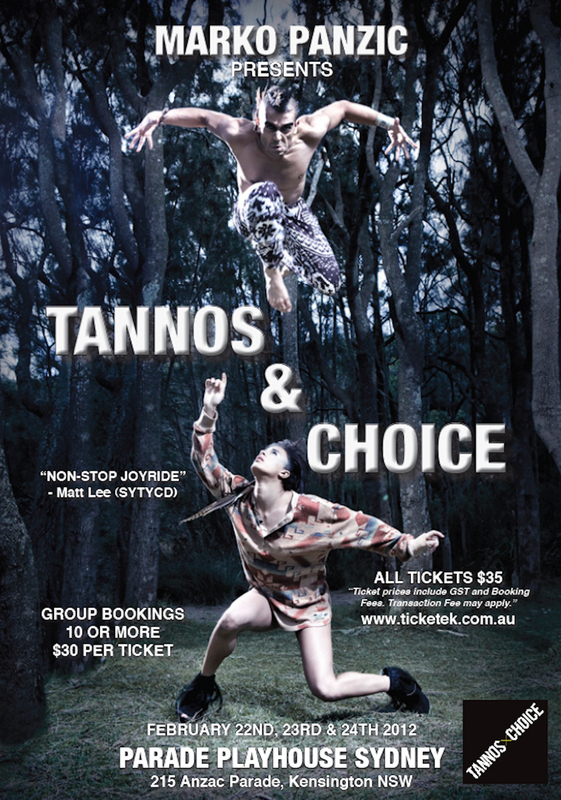 In February 2012, Tannos+Choice will present their first stage show – a high octane, one hour dance spectacular also featuring 10 of Australia’s most exciting dancers. Produced by Marko Panzic a well-known and respected choreographer in Australia. Marko Panzic will be co-directing the show with Stephen Tannos & Morgan Choice. Interview with Stephan Tannos & Morgan Choice about there upcoming show in Sydney! What are you wanting the audience to take from seeing your show? – The main theme and inspiration behind our show is EMPOWERMENT, our main goal is to inspire every single person that comes to see it. Something that Morgan and I have always felt quite strongly about is the will to take risks and chances in all of our work. We have always been passionate about inspiring the younger generation of dancers around us, and through the pieces of work in our show we aim to a demographic that we believe is limitless.. there is something for everyone in this show. So whether your’e a young dancer or the brother, parent or grandma of a young dancer we aim to instil a belief in everyone that dreams can really come true. – The rehearsal/creative process to this show has really shown Morgan and I how much we can achieve if we really throw ourselves in to the deep-end and believe in our choices, no matter how far-fetched they are.. We have literally changed our whole outlook on life as dancers and choreographers, our minds are so much more open and our vision is so much clearer… We literally wake up every morning with aching bodies and a fire in our eyes, this process is truly becoming one of the most rewarding and satisfying processes of our lives… we are truly so excited to share with the community what we have worked so hard for! Describe what people should expect from this show? – Without giving away to much…. I think what you can expect to see from the show is our unique version and vision of choreography and dance. We have truly strived to re-create the past in our eyes and through our brand of movement.. We have literally created a 4 minute piece of music entirely made up of my voice.. just to give away a little bit. We have worked in the recording studio, using vocal percussion and live drumming and worked with an incredible electronica music producer to create sounds that I believe have never been heard in conjunction with dance before. Put all of that together with a cast of 10 incredibly brilliant, versatile and creative dancers who will literally leave you breathless! the show will also feature a very special guest performance and some incredibly inspiring words from our idols who I am sure you will all recognise! How many dancers are in the show and what are they all bringing to the show? Stephen and I have got 8 of our favourite dancers in Sydney. We are so privileged to have been blessed with dancers that are absolute masters in all elements of dance. Each dancer over the time of creating Tannos&Choice have been a constant inspiration, and I know that that inspiration will bleed to our audience. The dancers will bring I believe a new approach to dance and performance in Australia, their ability to tell stories through their powerful movement and connect with people is something i have never seen before!! How has this process been as a choreographer? The process has been absolutely life changing. Every day has inspired me in a new way and challenged me in all different journeys I would have never ventured into. We are recording live vocal percussion, producing our own music tracks, and have pushed ourselves choreographically to a completely new level!! Even if we bump into a tough creative day, and have a block in a certain area, we move onto the next and learn more things from that. I can safely say this process has been the pinnacle of my dance career choreography journey…. Why is it important for every dancer to see this show? I believe it is an absolute necessity for every dancer to see this show. Our message is to give dancers around the world the inspiration, determination and empowerment to create themselves in whatever their journey is, wether it be to a better dancer, actor/actress, or choreographer we want dancers to walk away from this show feeling invincible. I also think that its a massive ‘must’ for the younger generation to come to the show and really grab onto this message. The talent that is coming through the younger generation is unbelievable!! Kids are starting to want to create shows themselves one day and are really pushing themselves creatively, and i think this show would be a great beginning to spark the creative flame in all ages!! ENTER NOW at win@dancelife.com.au to be in the running for a FREE TICKET to this AMAZING SHOW! What a great promotion! I would absolutely love the opportunity to see Tannos and Choice’s new work. It sounds outstanding and not to be missed. Thank you! !